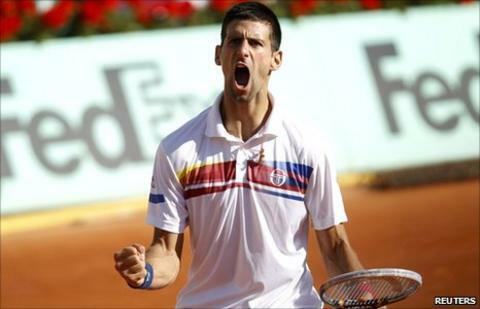 Serbia's Novak Djokovic is one victory away from becoming the world number one after reaching the last four at the French Open when Fabio Fognini pulled out of Tuesday's quarter-final. Fognini won an extraordinary five-set match against Spain's Albert Montanes on Sunday but injured his left thigh in doing so, and the Italian world number 49 from Sanremo had to withdraw from the tournament 24 hours later. As a result, Djokovic will face either Roger Federer or Gael Monfils in a match of huge consequence for the Serbian, even beyond the prestige of a Grand Slam semi-final. The walkover against Fognini does not count towards Djokovic's incredible winning run so he remains on 43 consecutive victories, and 41 in 2011, meaning a win on Friday would see him match John McEnroe's best start to a year of 42 from 1984. It would also ensure that the 24-year-old will overtake Rafael Nadal to become world number one for the first time next week. However, Djokovic cannot now match Guillermo Vilas's record for the longest-ever winning streak (46 consecutive wins in 1977) in Paris, but should he win the title that record could fall at Queen's in a week's time. As for Fognini, he was in an upbeat mood as he announced his withdrawal despite missing out on a first Grand Slam quarter-final. "I have a small muscle tear and the doctors have decided that I should not play tomorrow," said the 24-year-old. "It's really difficult. I am finally in Paris playing against Djokovic tomorrow and he hadn't lost like 40 matches in a row. It's difficult because it's the best tournament of my career, but I think it's the best solution." Asked how he had felt after the match on Sunday evening, Fognini added: "I was really happy because it was an incredible match. It was a four-and-a-half-hour match, I was happy for sure." Fognini was the first Italian to reach the men's quarter-finals at the French Open since Renzo Furlan, who lost to Sergi Bruguera in straight sets in 1995. He was also the first Italian to make it to the last eight at any major men's tournament since 1998.